We are all selling something. Talking with a customer? You’re selling, of course. Meeting with a business partner to consider staffing changes? You’re selling. Have you ever tried to sell someone on helping you with an idea or tried to sell the CFO on funding your team’s project? All sorts of factors can enter into a decision on whether to buy a certain product or support a particular idea. 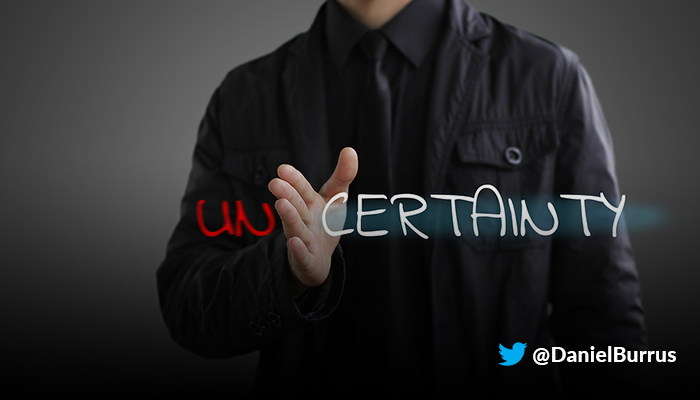 Uncertainty is a powerful tool that can be used to open the door to a sale; there is nothing better than a confused potential customer. But one thing is a certain deal killer—someone who remains uncertain at the end of the selling process. If someone is uncertain, they won’t say yes, they’ll say they have to think about it or get another opinion. They won’t write you a big check, and in one way or another, they will hesitate to take action. That makes certainty perhaps the most powerful tool with which to close a sale, be it the sale of a car on a showroom lot or convincing a superior to revamp your organization’s marketing strategy. Nothing ensures certainty more than an anticipatory attention to future facts. Unfortunately, far too often, many people’s efforts at persuasion are based on opinions—an “I just think this is best” sort of approach. However strong your case may be, leveraging opinions to win others over can be an exercise in frustration. If nothing else, they may say to themselves, that’s one opinion. I should get some others before making a decision. As an alternative, consider using something far more reliable and persuasive—future facts. For example, if you’re crafting a product geared to millennials, there’s no arguing the fact that every millennial on earth is getting older and, as a result, will most likely undergo a change of interests, attitudes and needs over time. What those interests and attitudes may be is open to debate, but the reality that millennials are, indeed, getting older, is an absolute certainty. That builds a solid foundation for you to anticipate future needs and craft solutions that will be in high demand. Phrased within the context of my Anticipatory Organization Model, future facts can also be referred to as Hard Trends. These are based on future certainties, facts that are not open to debate or dispute. For example, will technology assume a greater role in our everyday lives in the future? That’s an absolute truth, a Hard Trend that pushes any discussion past the point of debate. If you use Hard Trend certainties to support your objective, point of view or opinion, the high level of confidence this produces will naturally place you in a position of influence and advantage. Unlike offering opinions, a Hard Trend is a certainty that can’t be disputed. When you hear a future truth, you know it. You don’t need to read a white paper on the subject to understand and agree with it. That, in and of itself, is a compelling and persuasive form of leverage that naturally opens up another person to consider your product or ideas in a favorable, welcoming light. With the power of Hard Trends in mind, move the concept forward by being anticipatory. For instance, consider what Hard Trends—future facts—are going to impact someone else prior to meeting with him or her. If you were to sound it out, it might be something such as: “What are the Hard Trends that will impact the person, group or company I’m selling to?” Then, use your list of future facts to support the solution you are selling. Next, ask, “How can I help address any challenge or issue that this person may be experiencing now or in the future?” As a result, you go into a conversation ready to talk about the future your customer will be experiencing in an insightful way, all framed in the context of helping the other person. That, too, can push you closer to a successful outcome. Ultimately, you have shifted your role beyond selling someone on something to that of a trusted advisor who is taking a consultative approach that is focused on the customer’s best interests.